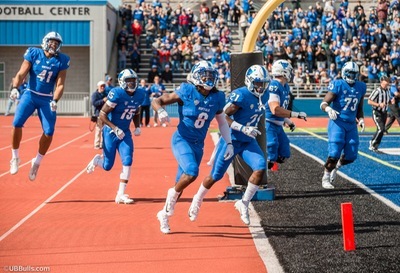 Each week, Bob Gaughan wraps up the college football weekend with a focus on the UB Bulls and the other big games and big upsets. The turning point in this game happened in the first quarter. UB started off hot and scored on their first possession when Tyree Jackson hit KJ Osborn for a 7-0 lead. The Bulls intercepted a pass and had an Emmanuel Reed TD run called back because of holding. The Bulls didn’t score after the holding. Being up 14-0 on Army would have meant a different game. When playing Army every possession is magnified because of their style. The Black Knights responded with two quick scores. The Bulls were down 14-7 when Adam Mitcheson lined up for a short field goal attempt. The kick was blocked and returned for a touchdown. Instead of the score being 14-10 it was now 21-7. Another huge factor was the health of star receiver Anthony Johnson. Johnson was hobbled with a hamstring injury. As a result he only played a handful of snaps. This allowed Army to play tight man coverage on the Bulls receivers. If Johnson were healthy the Bulls would have been better equipped to burn this type of coverage. Tyree Jackson had his worst game of the year. Jackson finished the game 10 of 24 for 152 yards and a touchdown. The fifth largest crowd in UB history (23,671) saw the Bulls fall to 4-1 on the season. The Bulls non-conference schedule is over. Next week they travel to Central Michigan to take on the 1-4 Chippewas. Syracuse came into the game at 4-0 but was still a 25-point underdog to the Tigers. Clemson survived after QB Trevor Lawrence was inured in the first half. Remember on Tuesday Kelly Bryant left the team after being upset that he lost his starting job to Lawrence. This meant that Clemson was down to their third QB. Chase Brice came in and with Syracuse up 23-20 made a huge throw on 4th and 6 with 2 minutes to play to give the Tigers a first down. Travis Etienne scored from 2 yards out with 41 seconds to play to save the day for the home team. Syracuse certainly impressed in defeat and should be a Top 25 team in spite of the loss. The switch to Ian Book at QB looks like a genius move for Coach Brian Kelly. Book threw for 278 yards and four touchdowns in the win. More importantly the Irish offense that struggled for the first part of the year looks so much better now that Book has taken over. The Irish dominated the game outgaining Stanford 550-229 and having 29 first downs to the Cardinal 10. Bryce Love was limited to 73 yards on 17 carries before limping to the locker room with about 11 minutes to play in the game. Have to hand it to Ohio State. With Beaver Stadium rocking in a White Out the Buckeyes found themselves down 26-14 with seven minutes to go. Dwayne Haskins then lead the Bucks on two TD drives. This over shadowed a great performance by Penn State’s QB Trace McSorley. McSorely had 461 yards of offense for the Nittany Lions. Goat of the game has to be James Franklin the PSU coach. Faced with a 4th and 5 at the OSU 43 with 1:22 to go, Franklin calls an inside hand-off to get the first. How do you not let McSorley make a play at that point? Horrible call and he deserves all of the criticism he’s going to get. *Dan Mullen goes back home and guts out a hard fought defensive struggle as Florida gets by Mississippi State 13-6. *Bad call by Bobby Petrino that cost Louisville the game against Florida State. With two minutes to play and the Florida State only having 2 time-outs, Louisville had a first and 10 at the FSU 20. The Cards were up 24-21 at this point. Petrino calls a pass that is intercepted. FSU comes down and scores to win it 28-24. *West Virginia scores 28 points in the first quarter to beat Texas Tech 42-34. Will Grier threw for 370 yards and three touchdowns. *Georgia’s defense held Tennessee to 209 yards in a 38-12 romp. The Dawgs defense is the best in the nation. *Kyler Murray threw for 477 yards and 7 touchdowns in the Sooners 66-33 win over Baylor. *Michigan rallied from a 17-0 deficit in Northwestern to win 20-17. The key to the comeback was that Michigan held Northwestern to 97 yards of offense in the final three quarters of the game. *Oregon responded nice after blowing their game last week to Stanford. The Ducks went on the road at Number 24 Cal and came away with a 42-24 win. *Kentucky is the real deal. The Cats improved to 5-0 with a 24-10 win over South Carolina. Kentucky has now beaten Florida, Mississippi State and the Gamecocks. They deserved to be ranked higher than 17th in the country.